Browse Home Improvement & New Construction for more articles like this. Outdoor solar lights are an inexpensive and elegant way to light your yard or garden pathways. Add motion detectors to wired outdoor lighting to increase security and safety while saving energy. The right indoor lighting makes rooms feel more spacious and comfortable, emphasizes architectural features, and can be artfully used to showcase your decorating skills. When shopping for lighting solutions on a budget, however, a little extra creativity might be required. These tips will help you perfect the lighting in your Highland Lakes home without compromising your cash flow. These easy additions instantly transform your space with almost no effort. • Get creative with lamps. Search thrift stores and consignment shops for lamps with interesting shapes, materials, or other elements. Use fabric paint and permanent markers to customize your budget find for a one-of-a-kind piece. • Revamp your light fixtures. Heavy sconces, lampshades, and metal accessories limit the amount of light you receive. Check out a local light fixtures shop in Marble Falls, Burnet, Llano, or other Highland Lakes locations for more delicate designs. • Let go of old-fashioned incandescent bulbs. Energy-efficient LED bulbs let you enjoy more light longer using less energy. Switch your 60-watt traditional bulb with an LED version, which emits the equivalent of 100 watts of light with less heat. These lighting tricks add illumination when and where you need it most without increasing your monthly utility payments. • Use solar lights in your yard, garage, and on the patio. Many models include a sensor that automatically triggers them to turn on during the darkest parts of the day. 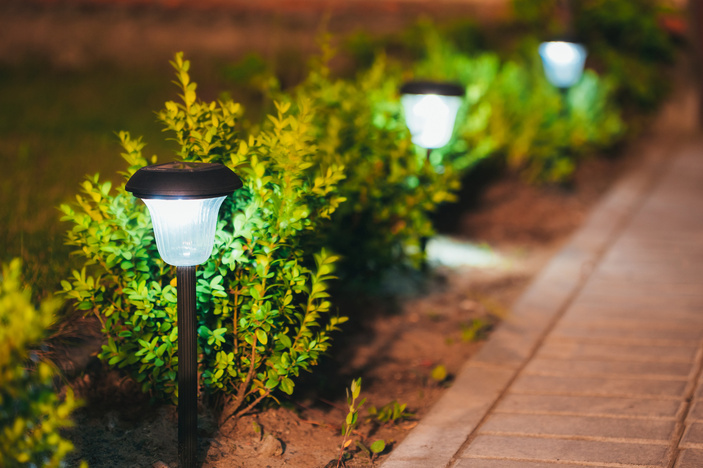 • Add a motion sensor to traditional outdoor lighting to ensure your important paths stay lit only when you need it most. Program it to shut off automatically after a certain period of time to conserve energy. These work well with security, garage, and bathroom lights. • Timers allow you to control energy use in high-traffic areas such as bathrooms and hallways. • Use track lighting for spaces with little natural light. Rolls of LED strip lighting easily adhere to most surfaces. Just measure, cut, and secure your lights in the desired position. These versatile luminaries blend well with a variety of home decor elements such as mirrors, wall hangings, and decorative room dividers. These remodeling ideas bring a lot of light into your space but do require a bigger investment than better lightbulbs or lighter lamp shades. • Install a skylight. A Marble Falls lighting company that specializes in light fixtures can help you plan and execute the installation. If you have confidence in your construction skills, a DIY design might save you a few dollars. This is a good option for windowless spaces and dark alcoves. • Open your space with extra windows. Choose plain-glass designs to take full advantage of all available natural lighting. Consider etched-glass windows for an elegant decorative element. • Lighten your window coverings. For a budget-friendly window refurbishment, change out your old, heavy curtains and drapes for lighter treatments such as blinds or sheer fabrics. Any of these tips can take your Highland Lakes home lighting from basic to bold. Check out the electricians and lighting dealers in the Highland Lakes Home Improvement Guide for more options.